On arriving in Israel thirty years ago, our first time living here as a family, we decided to rent an unfurnished apartment. Being a poor yeshiva student and owning no furniture, we decided to be minimalistic. We couldn't live without beds, so, like anyone else who needs to acquire something, we went shopping. Back in those early days, other than supermarkets, all retail transactions took place in central Yerushalayim. The owner of the small furniture store in Shlomtzion haMalka Street was friendly and pleasant to deal with. Though we ordered two of the cheapest beds in the store, he seemed pleased enough -- business was slow. For reasons beyond the scope of this article, later the same day we rented a different, partially furnished apartment, meaning we longer needed our new beds. We immediately returned to the nice furniture man, informing him we unexpectedly had to cancel our order. There could have been no damage, I thought, except perhaps to his ego -- the beds were not due to be delivered for another ten days. They were probably still pieces of timber. The retailer, however, was not prepared to refund our money. He blamed the then still relatively new V.A.T. authority for this. They assume, he told us, that if the seller cancels an order, he "must" still be delivering the ordered items, but now taking the money "under the table". He maintained that he didn't even know how to make a refund under the V.A.T. law. I was a bit angry at his response, and certainly wasn't going to go through with the order because of his bureaucratic inability. It was maybe three years later when I opened my own Israeli business and tax file, and had an inkling about V.A.T. issues. The V.A.T. office is difficult to deal with, but it was possible, though frowned upon, to issue refunds. I told furniture man that if he did not cancel my order, I would ask the bank to stop payment on our cheque. We did not yet have our own bank account at that point -- the cheque was drawn on my sister-in-law's account. I asked her to stop the cheque, which she did. We never heard from the furniture seller again. I only learnt later that stopping a cheque is illegal in Israel. There is a well known supermarket chain, which started as a stall in Jerusalem's Machane Yehuda open-air market. After a few years, as things were going well, the proprietor took a large shop front in one of the nearby side streets. Later his son took over and further built up the business. I used to shop there -- he was cheapest disposable nappy [diaper] seller in the area. The layout of the store was difficult to navigate. I always found the floors looked a little dirty and the lighting dim. But, on many products, great prices. The new owner was very shrewd. He decided to take on the Israel supermarket oligopoly. In the old days there was a makolet, a little grocery store, on every second street corner. Also there were the open-air markets. But the supermarket sector was dominated, as usual in Israel, by the trade unions and the political parties. The new kid on the block was great at continually fluctuating his prices. That way people would remember the cheaper prices and come back for more. He is the king of loss leaders. Israelis -- actually I think it's Jews the world over -- love a [percieved] bargain. The loss leader items bring people into the establishment. Once inside, they don't always bother, nor are overly aware, of the prices they are paying for other goods. Our man has been very successful, making a significant dent in the oligopoly. Others have since followed his lead. He even opened an outlet in our area. Most locals are happy for the opportunity for "cheap" shopping. I, and some others, are not too happy about his presence, for two main reasons. First his appearance has effected other area businesses. It's not just that people have left the locally owned supermarkets in droves, but other, non grocery local businesses have been seriously effected, simply because of the drop in the number of people now coming to the local shopping strips. For example, I was told that the local burger joint's business is down by a whopping 30 percent -- and he is the only burger parlour in the area. Second, the new store employs Jews and non-Jews, the latter in large numbers because they are prepared to work for less. The local stores were limited on whom they could employ following a terrorist attack, which ended in a dead terrorist inside one of them. Unfortunately ethnically mixed workplaces have led to unwanted "mixed" relationships. This is a growing problem in Israel today. As strange as it might sound, there are reported cases of religious Jewish girls, doing their National Service in hospitals, "going out" with non-Jewish doctors. Our mayor doesn't seem to notice these potential problems and prides himself in proclaiming that his neighbours shop in a supermarket where the workers hail from the village below his house as well as from Kiryat Arba, which lacks sufficient employment for its citizens. He recently brought a senior government minister to "show" him his grand "achievements" of integration. My friend Sasha loves shopping there. He doesn't fully realise that you generally get what you pay for, that buying cheap, unless it's a loss leader, often results in lower quality. But on the visit to which I am now referring, he simply dropped in to pick up a packet of teabags for the school staffroom. While he was there he noticed that many of the fruit and vegetables were marked down to 20% of the "regular" price. The only "condition" was, and I am basing everything I say here on what Sasha told me, that the total purchase exceeded 100 shekels. So off goes my friend and buys two or three kilos of everything marked down. He arrives at the checkout counter and the total bill is 120 shekels. Perfect. No! The cashier tells him that the discount deal only applies to purchases where the total bill, outside of the discounted fruit and vegetables, is over 100 shekels. Sasha protests, slowly reading out aloud to the cashier the words on the poster. There was no mention of anything being exclusive of the total tally. And there was no small print. As Sasha presses his point, the cashier calls the store manager. Manager argues with Sasha and Sasha argues with manager. The manager, certainly not understanding too much about customer relations -- not unusual in our region -- "requests" Sasha leave. "I don't want to sell to you", he says. "Get out of my store." A lively conversation ensued the next morning in the gym. Was the manager legally or morally justified? Our friend the [retired] judge posits that a seller is not required to open his doors to everyone, that his premises are private property. A rabbi as well as a judge, he claims that Talmudic law would agree with his assertion. Needless to say, not everyone agreed with his position. Surely, I interject, the shop is open to all members of the public. The unenforceable custom until this time was to accept a return in exchange for a credit note, sometimes time limited. During the olden days in Israel, every residence was required to have, or have easy access, to a bomb shelter. The 1991 Gulf war introduced a new war fear -- chemical weapons. A bomb shelter provides no protection from such an attack. The dirty substances easily enter. So the Home Command decided that from then on, each housing unit must have a "safe room", combining reinforced steel with an ability to airtightedly seal off the room. The nice thing about a safe room, is, that other than its cumbersome steel door, it doubles as a "regular" room. Our safe room functions as the playroom, the kids' computer room and a spare bedroom. It isn't very big, but is very utility. In the middle of the room lay an ancient mauve rug. With one grandson already in the family, and another on the way, in addition to nieces and nephews, Jill felt the time had arrived to upgrade the room, starting with the mat. I measured the available space. The maximum area was 2.10 metres by 3.20. We did not need to fill the entire area, but preferred to cover as much as possible. So yesterday I made one of my rare visits to Yerushalayim, for the rug and for new light fittings for the lounge and dining rooms. We visited a couple of light shops in Talpiot, not seeing anything that overly jumped out, yelling, "I am exactly what you are looking for!" Continuing our search, we crossed the road to Beitili, a house fixture shop. We still did not find our hearts' desire. But there is Carmel Carpet outlet in the same complex. Carmel's products are generally of a very high quality, with a price to match. Jill wanted something nice, so we were prepared to pay, up to a point of course. Everything was nice, but very expensive. Then the very polite and patient salesman took us upstairs to where they kept superseded models. These were about 40% cheaper. We found a pretty semi-shag rug which we really liked. It was a little smaller than we really wanted, 220 by 160 centimetres. But it would look grand in the room. We cheerfully allowed the salesman to swipe 790 shekels. I wanted to carry it to the carpark -- it wasn't heavy -- but he insisted on wrapping it for us to pick up in the car on the way home. We were happy -- one out of two achieved in under forty minutes! Great going. We decided to then check Home Centre's light fixtures. On the left of the down escalator is a big window, opening onto a supermarket below. Right under us was a ceiling to floor rack of rugs. We divert to the supermarket. 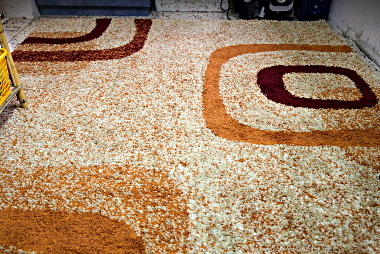 These carpets were 260 by 180, a better size, had very nice designs, and best of all, only cost 198 shekels. Sold to the man in the Akubra hat! Jill agrees to go back to the first shop for a refund. But first to Home Centre next door. We check out the lights -- long rolled up mat under my arm, careful not to smash a glass light fixture. Again nothing jumps out at us. I see we're not going to find anything quickly. Oh well. At least we have a carpet. Then Jill says, "They sell carpets here too. I'll take a quick look". "No! ", I groan, "I'm not coming -- two carpet purchases in one day is plenty for one man. You're happy with what you just bought!" "OK, you sit here, I'll be back soon." Of course, there was nowhere to sit, so reluctantly I follow her down the aisle. As I enter the carpet display area, the salesman, wearing a Carmel Carpets shirt, says something to me. "What?" I retort. "That carpet is an xxxxx (I forget the name he used). Where did you buy that?" "What did you pay? Oh, 198's an OK price -- we sell it too, even though it's not Carmel. I could have given it to you for 170, but 198's OK. I don't want to talk you out of it." In the interim Jill is already perusing his carpets. Real Carmel models. 290 by 200 -- great size! Really pretty, colourful patterns. Nice orange and brown. Really nice texture. Not rough like the one I'm holding under my arm. We immediately fall in love with it. And only 799.99 shekels! Sold to the man in the Akubra! Jill takes the carpet from under my arm and returns it to the supermarket while I finish off with the salesman. At the supermarket, "Wow you already went home and it didn't match?" No problem, they cancelled my original credit card transaction. In the meantime, I'm still talking to the Carmel salesman. He only now tells me that the carpet we just returned has the largest return of any product they sell. If it gets a little wet, it smells terribly. The new one has a full guarantee (whatever that really means). We talked about all kinds of things. We became great friends. He teaches at a gym in the evening, so we chatted about diet, training methods, etc. Jill came back looking for me. She was certain I must have returned to the parking lot. We march off to the checkout with the rug and the sales slip. The cashier runs the barcode scanner over the label. 1,140 shekels please! What? Look, on the price label and at the sales slip -- the price is 799.99! "Sorry, the computer shows 1,140 shekels." She phones the carpet salesman. He appears in twenty seconds, "What is the problem?". The cashier explains. Strange he says as he cellphones his boss. "Oh, yes, I forgot to mention that the 'sale' ended last week and you were supposed to 'update' the prices 'back' to 1,140." "What can you do for my clients? They are such nice people etc, etc, etc." "Give them 10% off". Jill says forget it. You have to sell it for the marked price. With Sasha's recent experience in mind, I try to be as polite as possible. The cashier and the carpet salesman both agree with our position, but the computer is the computer is the computer. The saleman again calls his boss, explaining our position. The big chief eventually relents. We bid farewell to the salesman as the cashier enters 800 shekels into her computerised till. P.S. The first Carmel salesman refunded our money, though it was obvious that he was not too happy about it. C'est la vie!